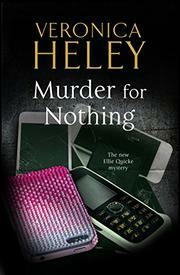 Philanthropist Ellie Quicke solves the murder of a young woman she doesn’t know in a house she doesn’t own. After helping her friend Lesley Milburn’s niece Susan find appropriate attire for her aunt’s wedding (Murder in Style, 2016, etc. ), Ellie goes the next step and rents the healthily-proportioned young woman an apartment in her spacious Victorian home. The young culinary student proves an ideal tenant, paying proper rent, keeping her quarters tidy, and filling the larder with tasty homemade treats—nothing like Angelica, the cousin of Lesley’s new husband, Andy. After her own mother pitched her out, Angelica moved into Andy’s flat until his bride put her foot down. The girl then went weeping to Ellie, who made the mistake of allowing her to stay for a night or two. As days stretch into weeks, the spoiled child spends her days shopping, flaunting her trim figure and adorable face in front of Susan, and running up taxi fares, which she carelessly diverts to Ellie. Things come to a head when darkly handsome Rafael turns up demanding that Angelica repay the loans he’s made to her. Worse yet, Angelica admits that she tried to earn back the money by hosting a rave in Lesley and Andy’s flat, leaving the place thoroughly trashed. But the broken furniture, looted jewelry, and heaps of rubbish strewn over their carefully tended condo are small worry compared to what’s in the backyard: an unidentified young woman lying dead in the ornamental pool. Heley couldn’t be more black and white. As Susan sticks to her studies and feeds the odd lot of strangers who’ve invaded Ellie’s world, Angelica continues to trespass and demand, until Ellie must point out that, no, she really can’t raid the charitable trust she administers to pay Angelica’s debts. Heley’s latest round of good versus evil is most likely to appeal to fans who like their puzzles uncluttered by moral complexity.